In a day when many children do not feel loved and cherished, tangible expressions of love become crucial. Lisa Soares Hale has written Penny Love, a young child's picture book that expresses the value of the love of a grandmother for her grandchild, love manifested through generations, and the enduring power and blessing of expressing that love. The idea is simple. A grandmother tells her granddaughter that every time she finds a penny, "You will know that I love you." Pennies are everywhere, and by the time the young girl becomes a bride she has built up her own tradition of declaring her love whenever a penny is found. Simple things are often the most profound, and Lisa Soares Hale's story registers on a deep level the kind of faithful love that many are longing for. 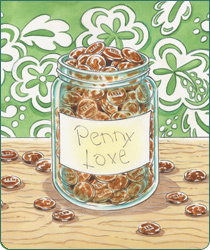 In reading Penny Love, young children will feel the assurance of the little girl in the story as she is reminded of her grandmother's love every time she finds a penny. Parents will see the underlying importance of expressing love in tangible ways. Readers young and old will be reminded of the enduring power of love. "Penny Love is delightful! I love it and would like to start that tradition with my granddaughters the next time I see them." "This is a heartwarming story to be read by all generations. The author has a gift in capturing the emotion that surpasses generations with the ongoing expression of love. It is a book that is soothing to be read-aloud for bedtime as well as a story to be shared with parents and grandparents. It is a story of the enduring nature of love which can be comforting to anyone who reads it. This book will be enjoyed by children and adults - time and time again." "A heart warming story, bringing you back to the simple things in life to use to express love. Refreshingly touching story of a relationship between a grandmother and her granddaughter." Copyright © 2006. PennyLoveBook.com All rights Reserved.